This Nativity is handcrafted from wool felt by Aigul in Bishkek, Kyrgyzstan. 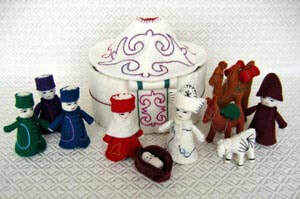 The traditional figures are joined by a decorated yurt—the traditional felt dwelling of Central Asian nomadic peoples. The wise men wear bright clothing with matching hats. The Joseph figure measures 4.5 inches to the top of his kolpok hat. The yurt measures 7.5 inches tall and 7.5 inches in diameter. Aigul has studied traditional Kyrgyz stitching techniques with other women and has also taught herself through observation. Life in the capital city of Bishkek can be expensive, so Aigul supplements her husband’s income by making handicrafts. Her one-year-old son keeps her busy during the days, leaving the evenings the only time when she can work on her crafts. Felt, or kiyiz in Kyrgyz, is manufactured through a laborious process. Sheared wool is first washed and dried. The dry wool is then placed on a chiy mat and whipped for several hours to make it fluffy. Next, the wool is sprinkled with hot water and the chiy mat is rolled up and tied with string. Once tied, hot water is poured over the roll in an open space and the roll is kicked and trodden on for several hours. This melds the wool together into a strong and durable felt. The chiy mat is then unwound and the resulting felt is left to dry.